Maud Gwendolen King, who was always referred to as Gwendolen by her family, was born to Mr. and Mrs. David King on October 2, 1876 at Kingscote in Newport. Gwendolen's younger brother, Philip Wheaton King, was born in Paris on June 5, 1878. The two enjoyed a quintessential Gilded Age childhood. They traveled extensively with their parents, enjoying a host of leisurely pursuits such as horseback riding, golf, tennis, beach outings, and picnicking. Gwendolen received a home education, although boarding and finishing schools for young women were growing in popularity. Her education was focused on art, literature, language, and etiquette. She had both French and German instruction, along with violin lessons on a daily basis. Much of her time was spent outside of what would be considered a traditional classroom. She went on many educational outings to museums and other cultural sites, and engaged in nature walks and hikes. Gwendolen's social debut was delayed by her father's unexpected death in 1894. It was not until the late summer of 1896 that Ella King hosted a coming out dance in Gwendolen's honor at Kingscote. 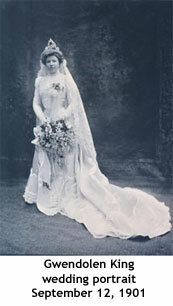 Gwendolen became engaged to Edward Maitland Armstrong of New York. Although the exact date and circumstances of the engagement are unknown, by the winter of 1901 Gwendolen and Ella King were in Paris preparing her trousseau. Much of Gwendolen’s trousseau was preserved. Lovingly packed away in the Kingscote attic, the Preservation Society staff discovered dozens of pairs of kid gloves, monogrammed handkerchiefs, finely embroidered and monogrammed nightgowns, petticoats, and corset covers. In addition to these standard linen and lingerie trousseau items, Gwendolen purchased several complete ensembles from the couture house of Raudnitz and Co. - Huet and Chéruit. Gwendolen chose this fashion house over the very well-known fashion houses of Worth or Doucet that had been preferred by her mother. The extant garments from Raudnitz and Co. - Huet and Chéruit, exude a sense of youthfulness in their use of lightweight, fine fabrics and simple modern styling, which probably appealed to Gwendolen. Gwendolen and Edward Maitland Armstrong were married on September 12, 1901 at Trinity Church in Newport with a reception following at Kingscote. They honeymooned in Europe, giving Gwendolen an opportunity to show off her new wardrobe. After their travels, the couple settled in Suffolk County, Long Island, in a small country town called Babylon. Edward Maitland Armstrong worked as a landscape architect based in New York City. Gwendolen was soon busy raising her family. The Armstrongs welcomed their first child, David, in 1903 and second son, Edward, in 1905. Their youngest child, Gwendolen Ella, was born in 1911. Gwendolen Ella Armstrong eventually left Kingscote and its contents to the Preservation Society, ensuring the preservation of this landmark house that encapsulates American history and culture of the 19th and early 20th centuries.